It has been just two months since the situation happened. It has also been seven months since Sweet Pea left. One would think my heart is made of ice by the way I keep adopting, but it is not the case. 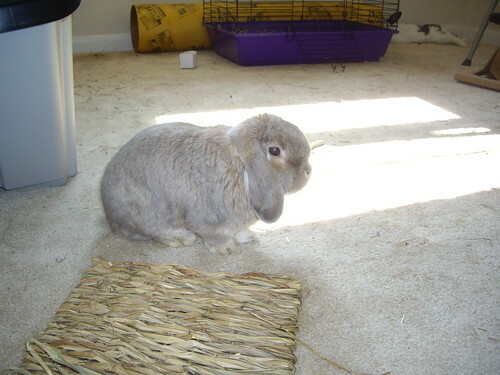 Instead, I know that there are unwanted and unloved rabbit sweethearts who deserve to live hoppily ever after. I also had no idea how one of them would hook my heart with his antics. Back in April, the suggestion seemed so simple: Julius was going to be home alone while I am working or away on business trips, so why not get him a friend? It took a couple of months later to get settled down enough, but finally the opportunity came. Unexpectedly instead of one, I adopted three older (usually the more undesirable in shelters) spayed female rabbits to hang out with him. 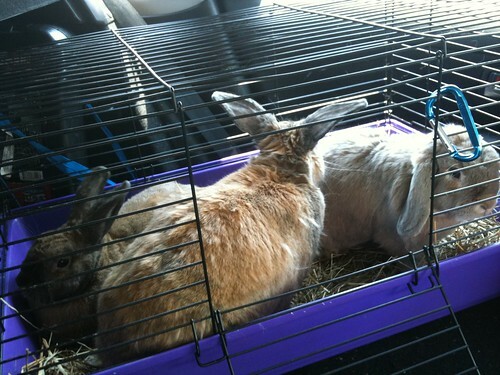 All three were taken home in the travel cage so as to start the bonding process. 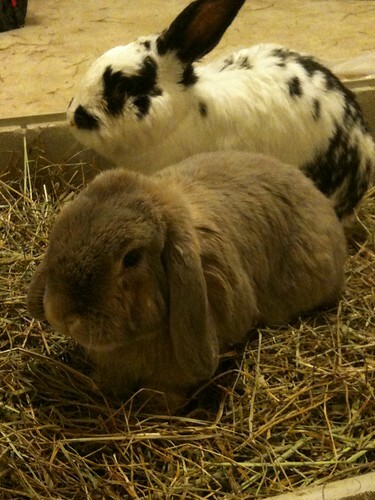 Arriving back at the house, the grey lop Rosemary was immediately boxed by Julius. Alarmed at his behavior, I reprimanded my poor old man for his rude antics. He looked back at me with a confused look on his face, then hopped away to sulk in a corner. 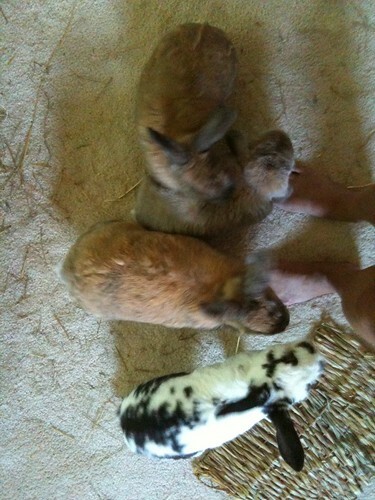 He left the other two brown/tan bunnies, Beauty (renamed Charro) and Zipper alone. In fact he was quite indifferent to them. Later, as Julius approached Rosemary, he looked up at me with the question, “Can I see the bun?” I smiled and said, “Only if you are nice.” After hearing that answer, he started grooming Rosemary. The two quickly became friends. Since bringing the bunnies home, I took it upon myself to check them out to make sure there was no surprises on their health. Rosemary did have some for me. Her lower glands seemed swollen and her diet needed to be adjusted due to bowel issues. 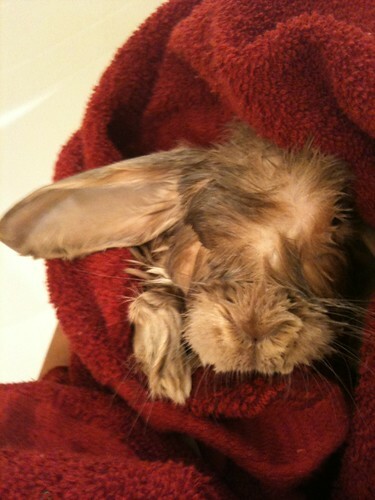 I even had to give the poor thing a bath (rare for bunnies due to their sensitive skin). I made an appointment for her to see Dr. Bonnie Brown at Jolly Pond Veterinary. At the appointment, I discovered a funny bit: Rosemary was a male. Her lower glands were “stimulated” from being with other females and another male even though all had been neutered/spayed. Laughing at the news, I renamed him to Rowan on the spot. Now I can see why Julius boxed him on sight. He saw another male invading his turf and was trying to put Rowan in line! Giggling, I shared the news about Rosemary being a boy with everyone, but kept Rowan’s name a secret as a future surprise. Unfortunately a couple of weeks later, Rowan became sick with stomach issues that produced the dreaded gas build up we rabbit owners fear. Up until the crack of dawn with him on Sunday the 18th of July, I knew that he may have to see an emergency vet. Sure enough, several phone calls later, my BFF and I drove him to Bay Beach Veterinary in Virginia Beach. Unfortunately, because the hospital receptionist did not understand that he was near dying, she did not put him on a must-see-asap basis. When over an hour came and went, I asked about why he was not seen yet. It was then explained to me that since I did not state he was dying, he was not put on the triage list as a priority. Upset, I explained that I had called three times to make sure that he could be seen right away. Finally a tech came out to to get him so she could insert an IV to get some fluids into his system. A moment later, we were told the vet will see us in the checkup room. Immediately my heart sank, then broke. I felt something was wrong and told my BFF, who assured me that all was okay and that I was being overly negative. The feeling was as I feared; Rowan died from being stressed out as the needle was inserted into his arm. As the vet asked why we did not bring him sooner, I wanted to kill her as my anger grew indignant. My voice was shaky as I did my best to explain the steps that were taken for him, and now the final outcome from bringing him to her hospital was his death. Rowan’s stiff body was brought to me so I could say my good-byes. Sobbing, I kept repeating that I was sorry while I held him. I kissed all over his face, his ears, the top of his head and stoked his back as if he were in my lap at home. Quietly a brochure on pet cremation services was given for me to read. Momentarily a phone call was made to the service, and Rowan was left at the veterinary hospital for pick up. During this mourning time I discovered “Cherish Pet Cremations” owned by the wonderfully empathetic Shirley Dale and her sister Barbara. This retired USPS woman began her business years ago after seeing how other folks were treated by the only pet cremation service in the area. Because I now live across in the Peninsula area, I drove over to Virginia Beach to pick up Rowan’s ashes. Her compassion shines through her whole self. In fact, not only was there a sympathy card with the bag carrying the metal tin of Rowan’s ashes, but a certificate on his cremation, a bookmark of the Rainbow Bridge, and a ceramic disc of his paw print accompanied it. What I like about the bookmark is that it has a heart-shaped piece of handmade paper attached to it that contains seeds. The seed-filled paper heart is for planting in memory of your loved one. This kind of detail in customer service is what I love to share. When the time comes for my other pets who leave for the Rainbow Bridge, I will definitely call Shirley. I found you on Twitter and also write a rabbit related blog. I am devastated to read your sad post. I have had similar experiences with vets over the past 10 years. I can’t stand ignorance and overworked vet staff, as well as vets! It is so painful . I wonder if the cremation service you mentioned is one that took care of one of our bunnies through the vet. They said they send it off. I am in Connecticut. One of our sweet rabbits was cremated and we received similar heart touching items with the ashes. It is amazing what a bit of compassion from another can do for you. I am sorry for your loss and I wish to continue following you. I will formally follow when I am done with my post.. Best wishes to you my bunny friend. Thank you for your kind words. It took two months for me to write about that day, but I knew it had to come out. It would be an honor to write a post for you! I believe you were at TYC when I was there talking with Andrea that day. I saw the hug and the chocolate and didn’t realize what happened. I’m so sorry. 🙁 If you have any of Rowan’s fluff, I am not the best spinner (I’m getting there!) but I will be happy to blend it with something and spin it for you. 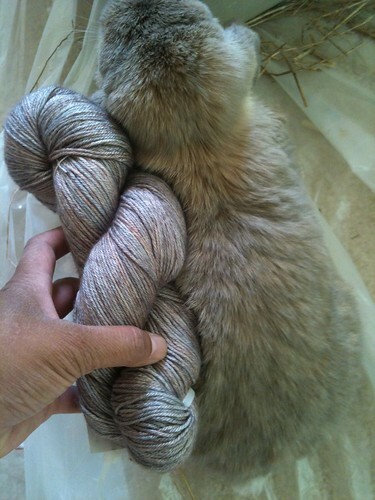 Maybe a nice trim for your planned shawl? Awww… Thank you! Please give them nose rubs from me and my guys too. My heart is heavy as I read this post. I am truly sorry for your loss and the way the veterinary clinic responded to the situation. I hope you’re beginning to heal and remembering Rowan more fondly than regretfully by days.